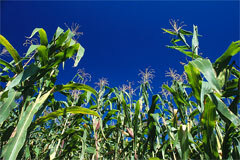 We grow more corn than anyone in the world. Ethanol Fuel made from corn is a stable reliable proven technology for the production of fuel that can run vehicles that are currently running on our roads. We have the technology, the land, the scientific and engineering know how to make this a reality. It will be good for the environment create jobs and it will stop our reliance on foreign oil. Forty percent of the vehicles in Brazil run on ethanol, so what are we waiting for?